Last year Sinful Colors had an obvious Valentine's display. I'm not completely sure that this year's new Tough Love display is really Valentine's themed, but it'll do to kick off my themed week. Calling it new is a bit of a stretch, since I think it was first spotted at Rite Aid around xmas. I also skipped Simply Silver, so it's not really the whole thing being shown here. (I'm kinda fudging things today, I'll cop to it.) Nothing against Simply Silver, I just have so many silver foils already. It's one of only three new shades in the Tough Love display, which is mostly a mix of some of the holiday metallics and fall's mattes. I had the reissued shades already, but I bought Taupe It Off and Black Cherry at Rite Aid. I wanna say I've seen this display at Wegmans too, but I'm not 100% sure on that. Enough babble....swatch time! Taupe It Off is a cool-toned light brown taupe with silver shimmer and a matte finish. I was hoping that Taupe It Off would be a little lighter than it turned out to be. I like it, but I'm not entirely comfortable calling it work-friendly. Partly because it's a bit darker than I usually like to go and also because it pulls very slightly green on me. I like it, but I feel like it stands out too much for the rules where I work. This is two coats and it applied easily without the glopping of some matte polishes. I wore it to work and it chipped within less than a day. Boo. 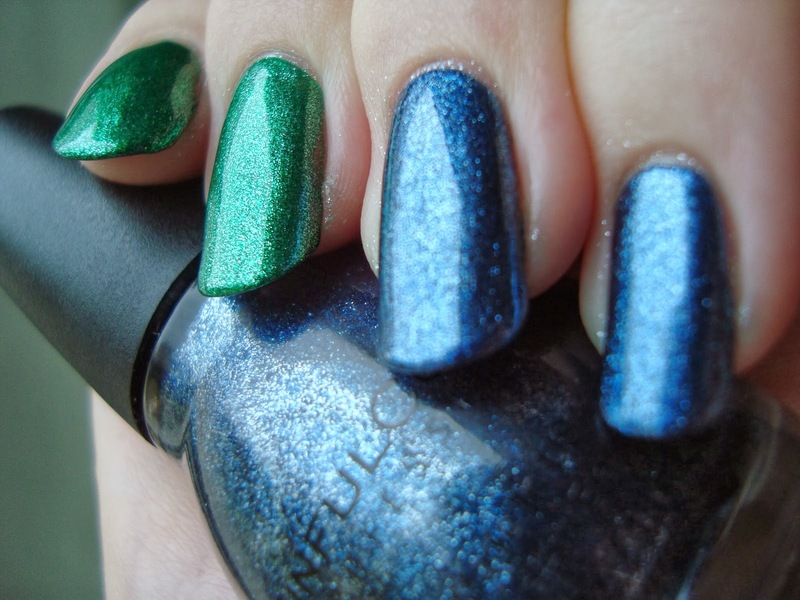 Still, this isn't that unusual for mattes and you can often extend their wear by applying a layer of top coat before the final coat of polish. When it's glossy it reminds me of Orly Nite Owl, though it's darker and with a different undertone and the shimmer isn't as dense. Black Cherry is a deep red matte cream. I love this! I'm not always a big fan of matte creams, but this...this is beautiful. I had to use three coats, since it's a bit on the sheer side, but I don't even mind. It's got that slight hint of the depth you get when you mattify jellies and that keeps it from feeling too flat or dull. I does cause the usual cleanup hassles that pretty much all deep reds do, but again...I don't even mind. I used Black Cherry as the base for tomorrow's stamping and I apparently forgot to take a photo of it glossed up without any stamping. Ooooops! Hopefully you'll like tomorrow's post enough to forgive me. The rest are reruns. Click the shade names to read my previous reviews and see more swatches. Red Eye is a vibrant pink foil. Blue Steel is a smoky blue foil. Gold Medal is a frosty metallic gold. Bottom line: Steer clear of Gold Medal. I have a hunch that it might stamp well, but it's just not good on its own. I'd recommend the rest, with the caveat that Get It On is along the lines of a lot of the other berry pinks Sinful Colors often releases. Did you catch the part where I said I was doing a Valentine's theme week? Weird, right? I don't know what's gotten into me! The matte navy colour is my favourite, I don't own a completely plain navy colour without glitter and this one looks gorgeous on the nails! I have all of the foils including Pine Away..they are absolutely gorgeous. Taupe It Off is also gorgeous. I don't have and don't want Black Cherry or Gold Medal...they just don't appeal to me, at all.